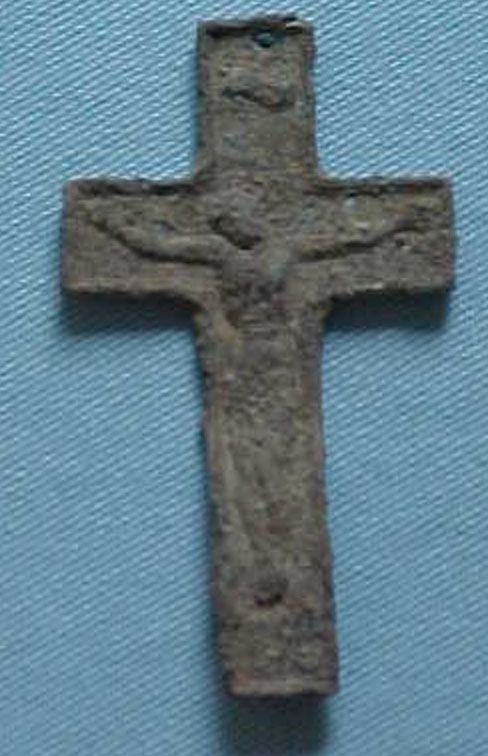 A fantastic discovery by archaeologists is called cache #1 found in winter kitchen excavation unit 95-29. 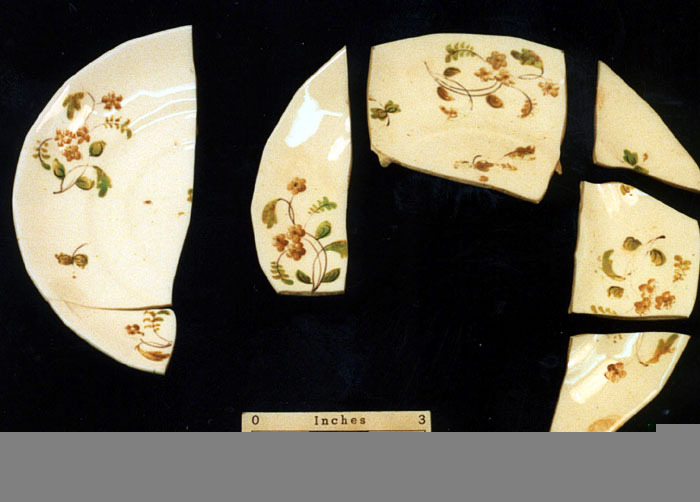 The cache included a white ware plate foot ring sherd with manufacturer's mark, blue star transfer ware platter rim sherd, white porcelain bowl sherds (6 specimens), blue transfer print white ware basal/rim/body sherds (4 specimens), gold over painted porcelain saucer body/rim sherds (2 specimens), polychrome over painted sprig style white ware bowl (5 specimens). Photograph by Lesley Lehr-McDaniel and Karen Miller (1999) and provided by U. S. Grant National Historic Site. 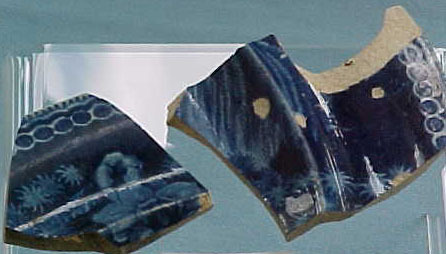 Closeup of the blue star transfer ware platter rims sherds. 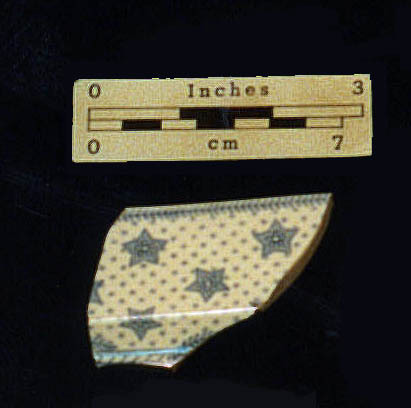 The presence of this sherd in cache#1 is not accidental. The design element is unique and very evocative. 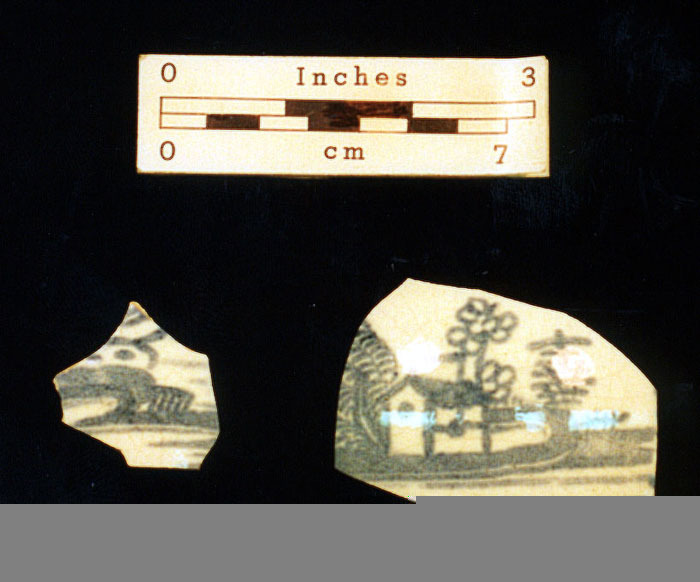 Photograph by Lesley Lehr-McDaniel and Karen Miller (1999) and provided by U. S. Grant National Historic Site. 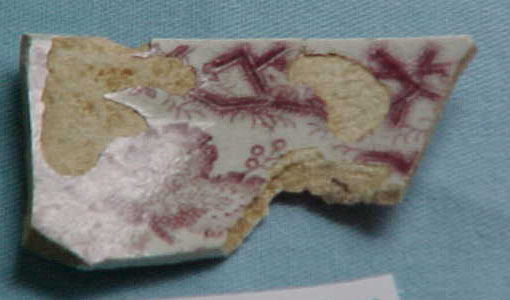 Closeup of blue transfer ware sherds from cache #1. 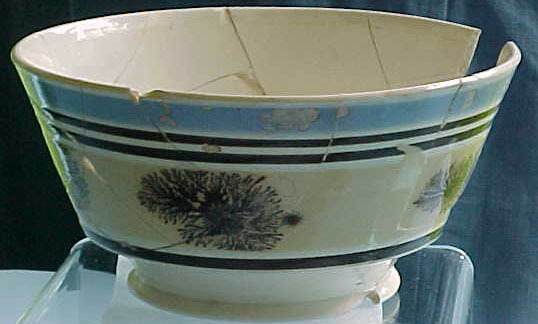 Photograph by Lesley Lehr-McDaniel and Karen Miller (1999) and provided by U. S. Grant National Historic Site. 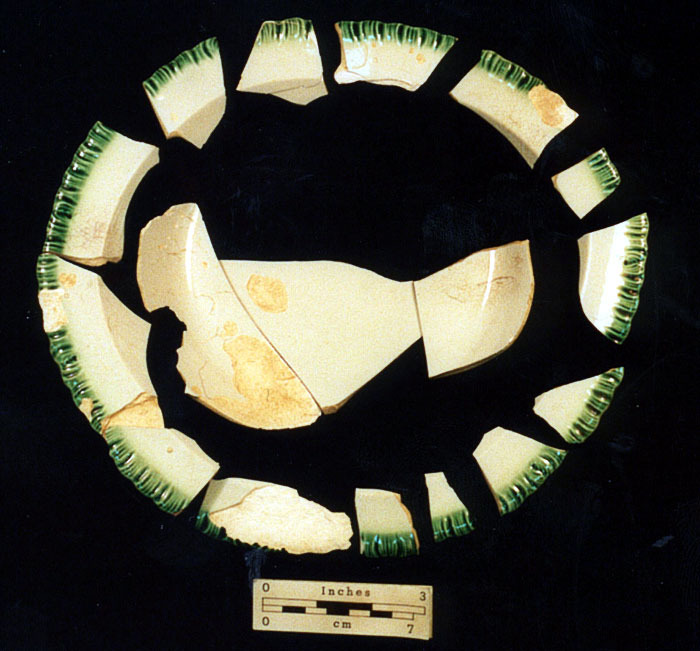 Sprig style white ware bowl sherds found in cache #1 in the winter kitchen excavation unit 95-29. Photograph by Lesley Lehr-McDaniel and Karen Miller (1999) and provided by U. S. Grant National Historic Site. What is the significance of these artifacts? Professor Gladys-Marie Fry, an English Professors at the University of Maryland (specializing in African American folklore) discussed this feature in an article published in the St. Louis Post Dispatch in 1997. She interprets cache #1 as a "ritualistic breakage of vessels to keep the spirit of someone who had died from coming back" (Price and Hastings 1998 excavation report). Another very significant discovery by the archaeologists is called cache #2 that was discovered in the winter kitchen excavation unit 95-24. Top row includes the lid to a teapot or sugar bowl with green transfer print, brass wire, and a large animal bone. Middle row includes 2 brass oval door knobs with iron shank. 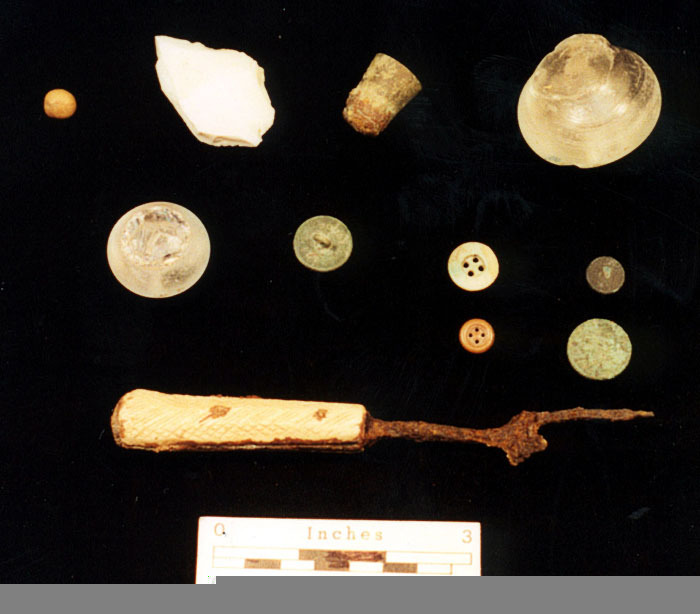 The bottom row includes a prehistoric American Indian projectile point base, 2 dolomite marbles, a clear glass drawer pull, brass spoon bowl, iron dinner knife (handle and blade fragments. 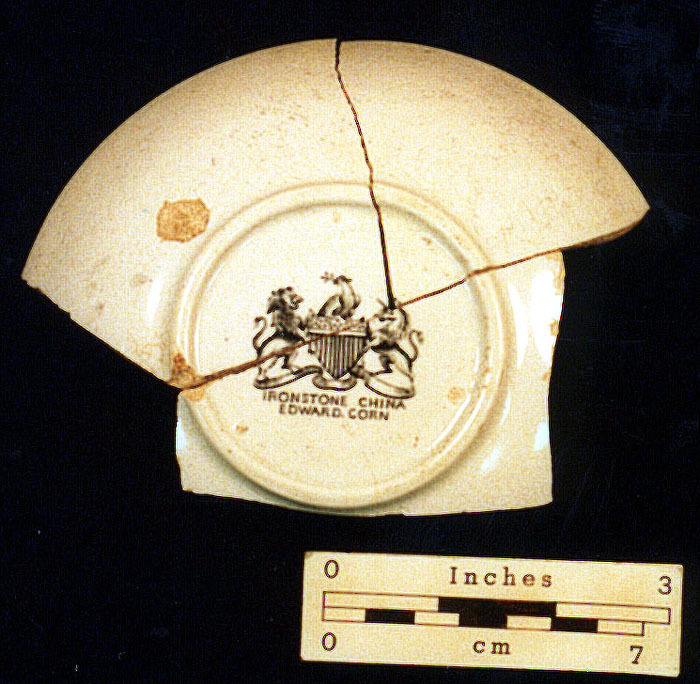 Photograph by Lesley Lehr-McDaniel and Karen Miller (1999) and provided by U. S. Grant National Historic Site. 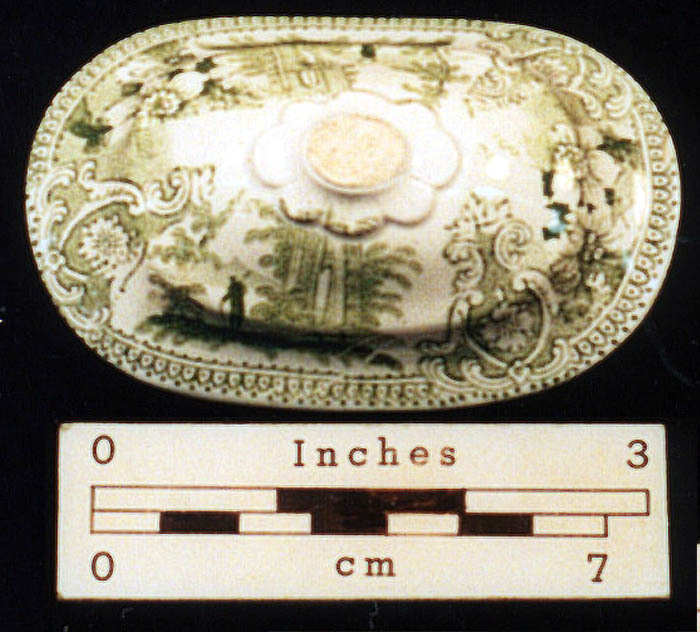 Closeup of the teapot or sugar bowl lid with green transfer print. Photograph by Lesley Lehr-McDaniel and Karen Miller (1999) and provided by U. S. Grant National Historic Site. Additional artifacts in cache #2 included a round rock, chert flake, chert bifacial tool fragments (Native American), steel bottom brass sided sewing thimble, clear glass drawer pull, clear glass composite stemball, brass button w/eyelet and lettering, 4 hole bone buttons (2 specimens), metal buttons (2 specimens), and a bone handle Sheffield fork. 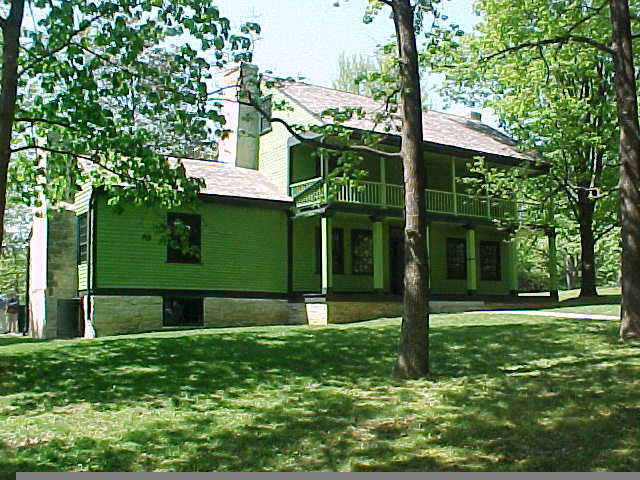 Photograph by Lesley Lehr-McDaniel and Karen Miller (1999) and provided by U. S. Grant National Historic Site. What is the significance of these artifacts? 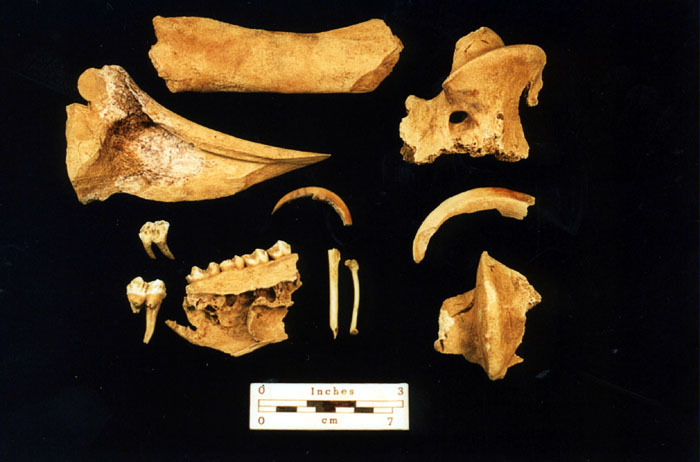 Mark Leone, a historic archaeologist with field experience in Maryland and Virginia (attached to the National Park Service office in Lincoln, Nebraska) discussed this feature in an article published in the St. Louis Post Dispatch in 1997. He interprest cache #2 as a "dininer's bundle" or "conjurers' cache". Here is how they may have functioned: "such a collection of objectes was a slave's way of coping with an uncertain and harsh life. Usually a slave had one to three objectives in placing such a bundle. One as protection for himself or herself from harm. Another was seeking a cure for an ailment or illness and the other was for bringing good forture in the future. Common in bundles are crystals, either natural quartz crystals or glass objects such as lamp prisms or clear glass knobs... Ceramic vessel sherds or parts such as a vessel lid were thought to contain a spirit." 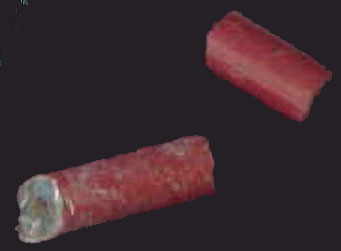 (Price and Hastings 1998 excavation report). 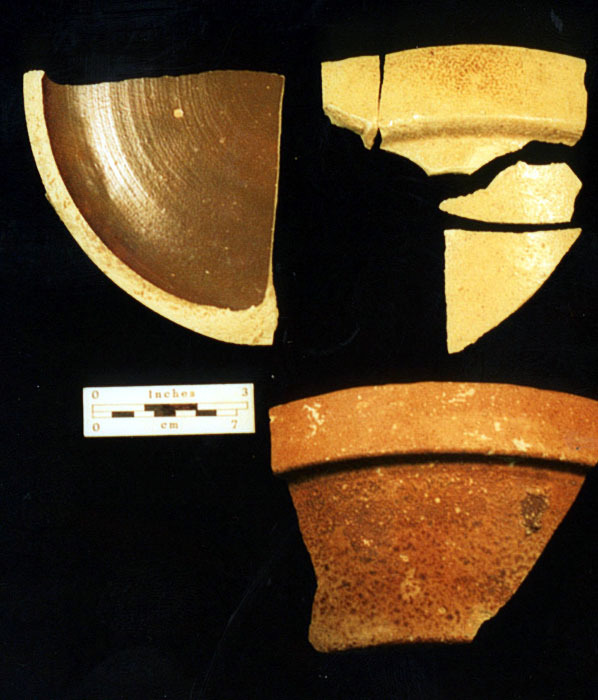 Many historic artifacts were found in the winter kitchen in addition to the artifacts in caches 1 and 2. 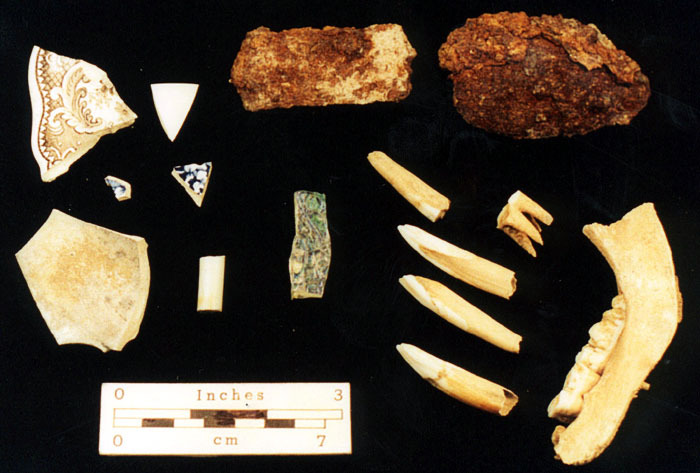 These artifacts include white ware, porcelain, utilitarian ware, transfer ware, metal serving spoons, and large mammal bones (teeth and mandible). Photograph by Lesley Lehr-McDaniel and Karen Miller (1999) and provided by U. S. Grant National Historic Site. Various animal bones found in the winter kitchen. Photograph by Lesley Lehr-McDaniel and Karen Miller (1999) and provided by U. S. Grant National Historic Site. Metal spoon with illegible manufacturer markings found in the winter kitchen. 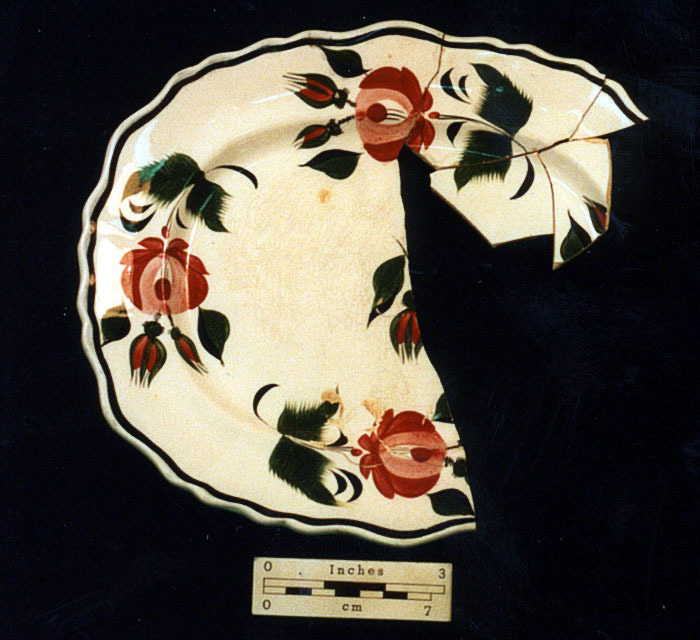 Photograph by Lesley Lehr-McDaniel and Karen Miller (1999) and provided by U. S. Grant National Historic Site. 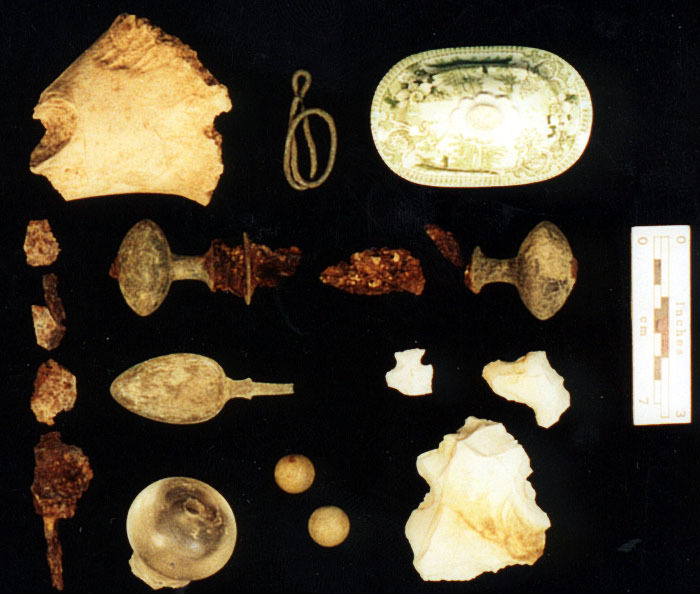 Personal items found in winter and summer kitchens including a toothbrush from the summer kitchen, a Kaolin tobacco pipe bowl (winter kitchen), bone hair brush (summer kitchen), yellow metal sewing thimble (winter kitchen) and brass chain (winter kitchen). 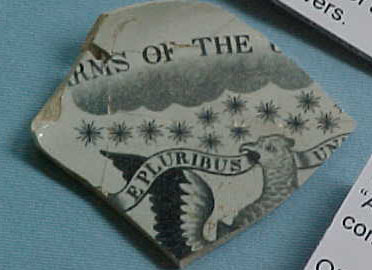 Photograph by Lesley Lehr-McDaniel and Karen Miller (1999) and provided by U. S. Grant National Historic Site. 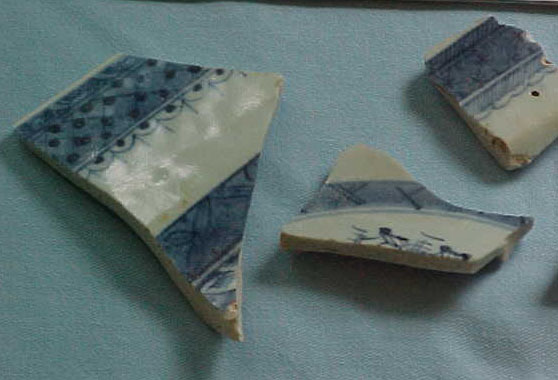 Body sherds from an Chinese import vessel found in the winter kitchen. Photograph by Lesley Lehr-McDaniel and Karen Miller (1999) and provided by U. S. Grant National Historic Site. Utilitarian crockery rimsherds and base found in the winter kitchen. Photograph by Lesley Lehr-McDaniel and Karen Miller (1999) and provided by U. S. Grant National Historic Site. 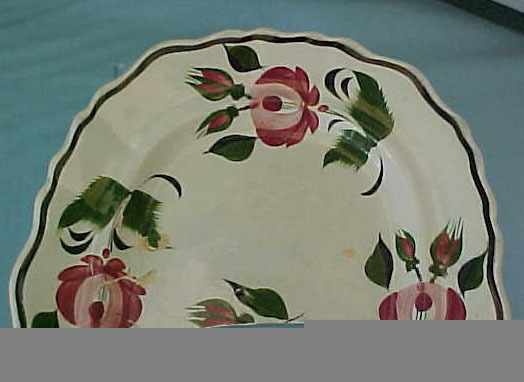 Even edge scalloped with bud pearl ware, manufactured as late as 1840, found in the winter kitchen. This distinctive ware is sometimes called green shell edge or green featheredge. 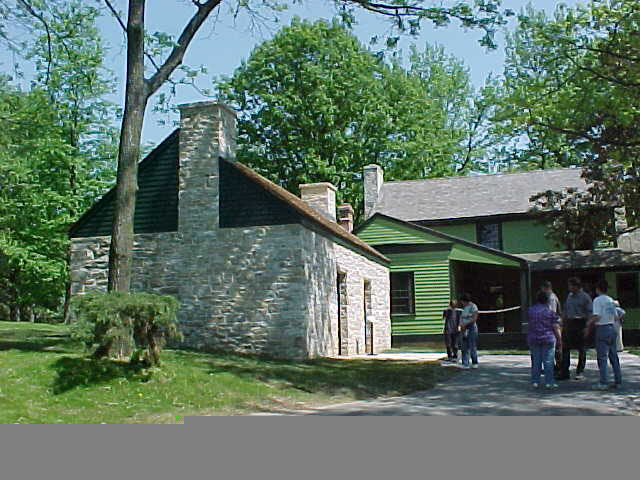 Photograph by Lesley Lehr-McDaniel and Karen Miller (1999) and provided by U. S. Grant National Historic Site. Ironstone with manufacturer's mark of TJ&J Mayer, Longport for O. F. Filley, St. Louis, Missouri, found in the summer kitchen. 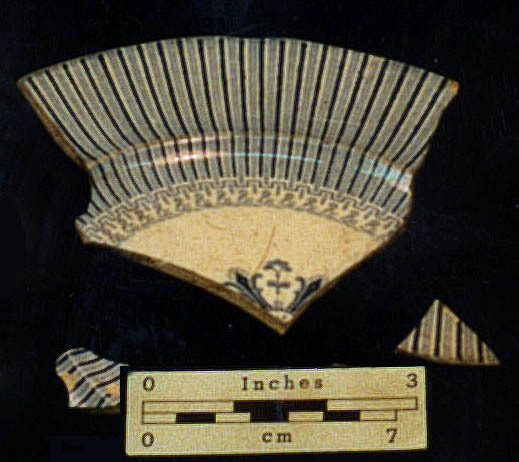 Photograph by Lesley Lehr-McDaniel and Karen Miller (1999) and provided by U. S. Grant National Historic Site. 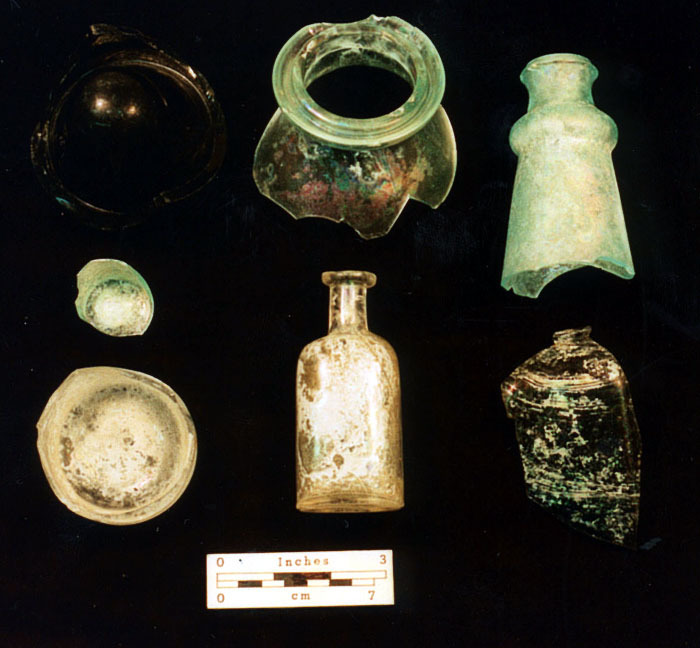 Glass artifacts found in the winter kitchen including a wine bottle base, lamp base, bottleneck fragment, bottle bases (2 specimens), small bottle, and square bottle fragment. Photograph by Lesley Lehr-McDaniel and Karen Miller (1999) and provided by U. S. Grant National Historic Site. Iron artifacts found in the winter kitchen including a stove fragment, harness buckles, a tool handle, and a stove burner lid. Photograph by Lesley Lehr-McDaniel and Karen Miller (1999) and provided by U. S. Grant National Historic Site. Ironstone with manufacturer's mark (Edward Corn) found in summer kitchen. 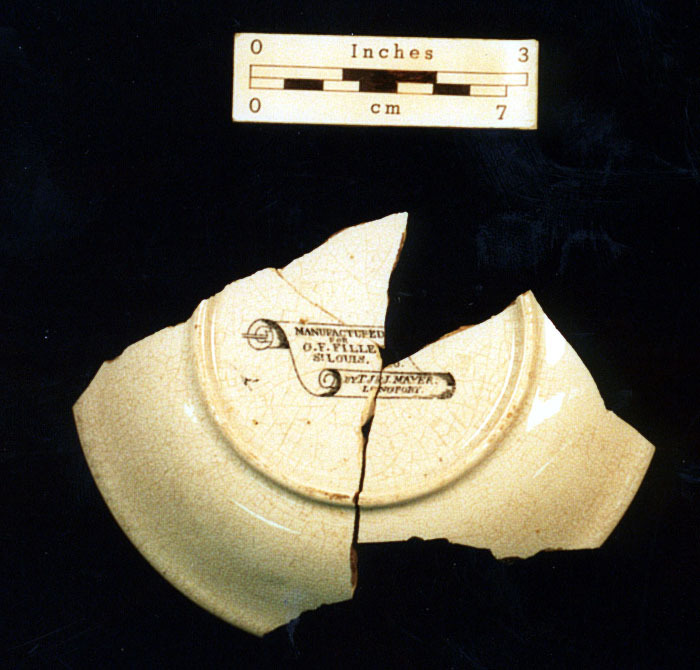 Photograph by Lesley Lehr-McDaniel and Karen Miller (1999) and provided by U. S. Grant National Historic Site. Platter from the window area of the winter kitchen. Photograph by Lesley Lehr-McDaniel and Karen Miller (1999) and provided by U. S. Grant National Historic Site. Sewing scissors found in the winter kitchen. Photograph by Lesley Lehr-McDaniel and Karen Miller (1999) and provided by U. S. Grant National Historic Site. Shell and brass buttons found in the winter kitchen. Photograph by Lesley Lehr-McDaniel and Karen Miller (1999) and provided by U. S. Grant National Historic Site. Coral beads of a variety often associated with Enslaved African Communities found in the process of access road construction at Whitehaven. Historians search out written records to understand how people lived. Two extremely important written records have survived that document life at Whitehaven. One document show us Whitehaven through the eyes of a white girl (Julia Dent Grant) and the second document gives a view of Whitehaven through the eyes of a black girl (Mary Robinson). The personal memoir of Julia Dent Grant was written in 1898. Mrs. Mary Robinson was interviewed in 1885 by a reporter from the St. Louis Republican newspaper. Short article (with some editorial changes by MJFuller) about the interpretation of the artifacts from White Haven. The article was published in Grant's Forum during Winter 2001, page four. Not all of the items found in the winter kitchen were work associated. For example, marbles were discovered. Julia (Dent) stated in her book that she and her sisters often had slave children as playmates. Her "dusky train", (as she called them) followed her around, playing and exploring in the woods that surrounded White Haven. Since Colonel Dent did not forbid such behavior, it is quite possible that the white children's toys found their way into the hands of the enslaved children. However they were obgained, these marbles suggest that slave children not yet old enough to assume full-tiime work duties,k or those that had limited chores to do, found time to play in the kitchen. This theme of leisure is continued with the discovery of slate tablets and pencils. Again, if you accept the kitchen as a gathering place for the enslaved, the importance of these particular itmes becomes apparent and gives rise to many questions. Were the slaves and their children literate? We know that Julia "...had read to them all of the pretty stories of the times." If so, how weas her perception of slavery different from the surrounding community and why? Were the enslaved teaching each other to read and write and keeping it a secret from the master, like the religious bundles? Missouri law prohibited slaves from acquiring an education , but we know that enslaved people ingeniously found ways to circumvent the law. From various accounts we know that slaves who lived in the cities were often able to learn to read and write from a variety of sources. 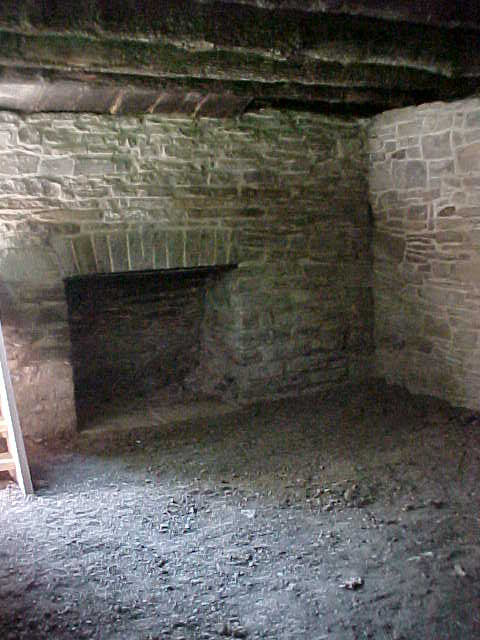 Many of the Dent slaves served their master at both the country home and the city town house, therefore they had an opportunity to learn these skills. We also know from Julia that at least some of the slaves practiced Christian beliefs, possibl providing another avenue for learening to read from the Bible. 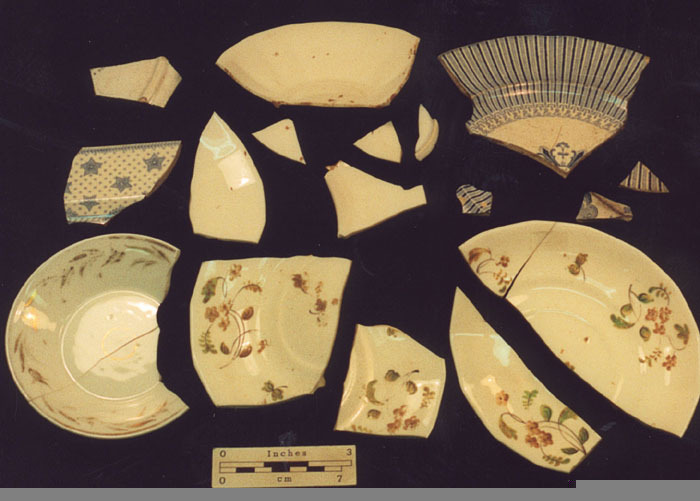 We know from viewing other artifacts found in the winter and summer kitchens that the slaves had personal items, either acquired from the master or purchased. 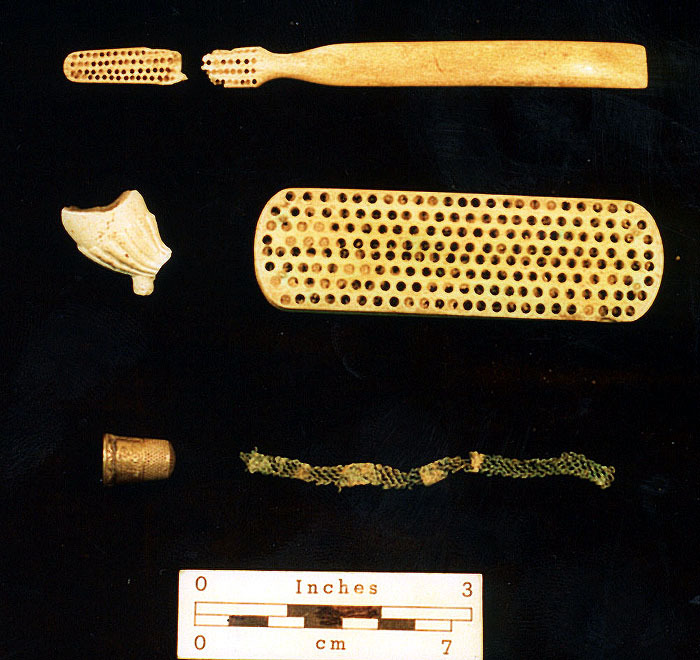 These were not crudely made objects, but finely carved, bone-handle tooth and hairbrushes, and a clay-molded pipe bowl. In her Memoirs Julia recounts how she often obtained money from her father so several of the slaves could purchase gifts for their wives. We also know that the practice of hiring out slaves occurred at White Haven and it is quite possible that a certain portion of the monies earned were retained by the slaves for purchasing such items. 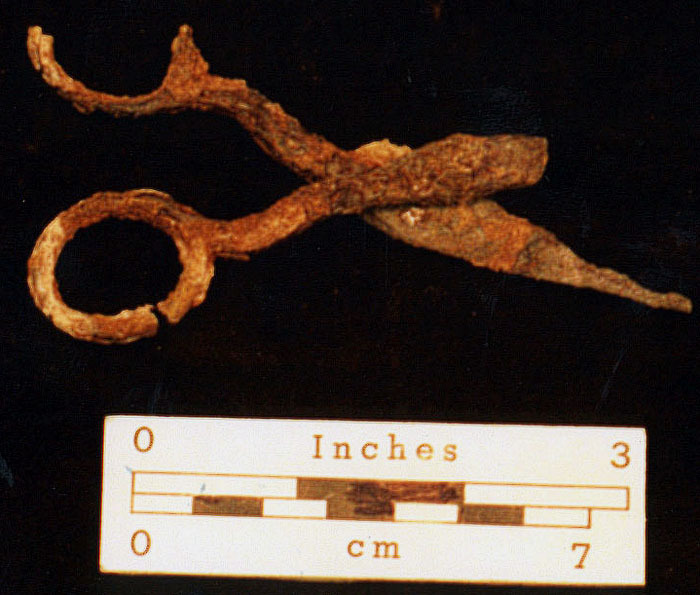 Along with the above objects, personal items of adornment were found; a copper mesh bracelet and two African beads. The bracelet supports the above hypothesis; however, the beads suggest something more revealing. Identified as "pre-white hearts" and tubular in shape, these were commonly used in West African trade, but also could be personal ssssadorment. These beads suggest a direct link to Africa and may tie descendants to a specific area in Africa. It represents as well a "continuation of culture for the African-Americans" and gives added weight to the theory that African culture was passed down and intertwined with the western European sculture at White Haven. 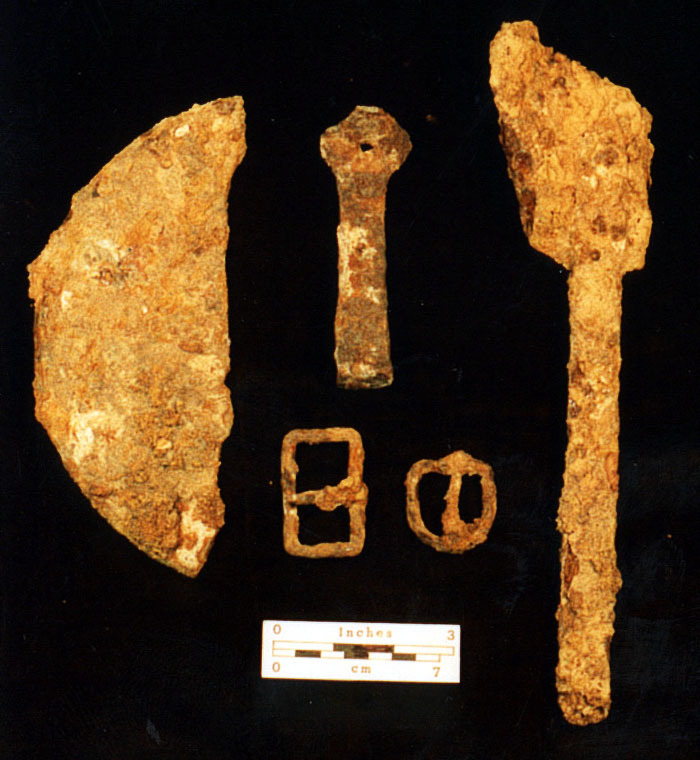 These archaeological artifacts expose much more about slave life and personal relationships at White Haven than the limited written information we possess. While our hypotheses and conclusions are speculative, these objects bring to life the enslaved African-Americans who lived and died here, and whose stories of sacrifice and perseverance are entwined in the history of the site. [This essay was based on a special study down by Lesley Lehr-McDaniel for Ulysses S. Grant National Historic Site, entitled Slavery and White Haven: A Cultural and Geogoraphical Study of Enslaved African-Americans. Webpage updated 30 December 2005.